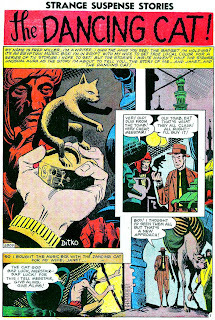 From Charlton's STRANGE SUSPENSE STORIES #37  comes "The Dancing Cat", a 5-page story about a TV writer who goes to Egypt with his wife to do some research on a series he's hoping to sell. As a gift for his wife he buys a music box in the shape of a dancing cat, not realizing that if you're in a comic book story set in Egypt you really should listen to that old beggar on the streets trying to warn you of a curse. 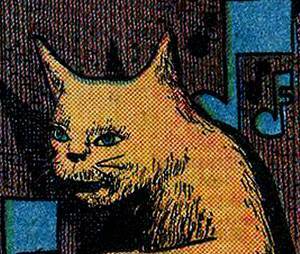 A simple but effective story, the floating musical notes are a nice design element around that ominous looking cat. That bit across the top tier of page four works really well.